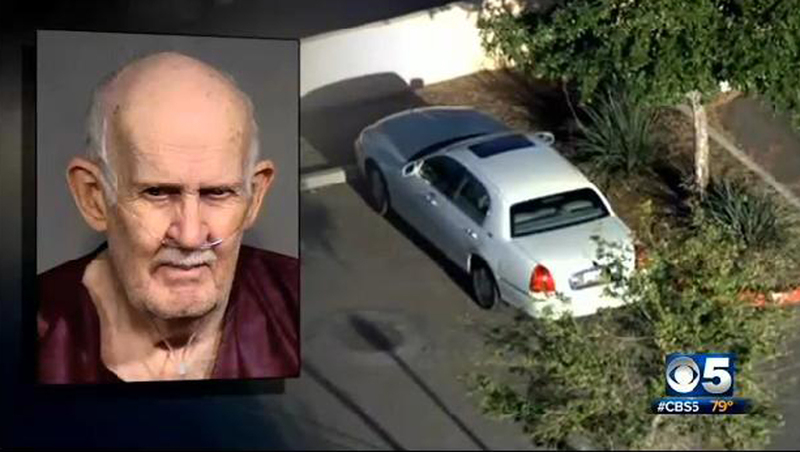 PHOENIX - Howard Rudolph, a 79-year-old murder suspect who disappeared after removing his ankle bracelet, has been found dead in his car of a self-inflicted gunshot wound, reports CBS affiliate KPHO. He had been charged with second-degree murder in the August 2013 death of his wife, Earlene. Rudolph's body was found inside his 2006 white Lincoln Town Car on Tuesday in a parking lot of the Lake Pleasant Village Apartments in Peoria, Ariz., in Maricopa County. "He was found dead, slumped over the wheel, with a bullet in his chest," said Sheriff Joe Arpaio. The suspect disappeared on Monday, and Rudolph's stepdaughter Diane Davis told KPHO that she feared he might commit suicide. "I feel like he would get away with it. He wouldn't have to face what he's done," she said. Rudolph was arrested Aug. 7, 2013 amid indications that his wife's death was a mercy killing. Sheriff's officials cited statements made by Howard Rudolph about Earlene being ill and what he wrote in a note found with a revolver at their home. Originally, Rudolph was being held on a $750,000 bond, but in February his attorney successfully argued for his release. The Maricopa County Attorney's Office opposed the release, as did his stepdaughter. Rudolph was to live with friends in Sun City West, according to the station. He was given a strict curfew and had to wear an electronic ankle monitor. However, when the suspect failed to show up for a pretrial hearing on Monday, a warrant was issued for his arrest. His ankle bracelet had reportedly been cut off and was found in a bush. "I knew he wasn't going to be [at the hearing]," said Davis. "I mean, from the get go, I knew he would not face what he's done. He's a coward." Arpaio told KPHO that detectives used information from Rudolph's discarded ankle monitor to determine his location, leading them to the dead body. He said data from the bracelet showed the suspect had been in the area within the past 10 days. It is unclear if Rudolph had help removing the ankle bracelet, or if he knew anyone at the apartment complex where he was found. Authorities are investigating.